made to order, dispatched in 21 to 25 working days. A fantastic 6mm flat profiled Titanium ring, comprising of two sections of Platinum (960( inlay sandwiching a slightly thinner band of Titanium. Both metals have a subtle matt finish, the inside is highly polished. 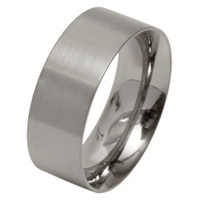 The ring is marked inside with the manufacturers mark "UNQ" (Unique) and "TITANIUM" so that you can be sure that you are receiving a genuine branded item.